Vice-President Yemi Osinbajo has described reports that he has resigned as “fake news”. 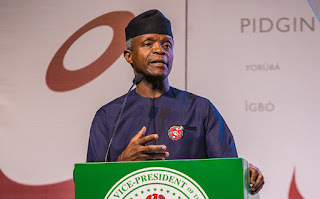 Speaking at a meeting with young Christian leaders in Lagos, Osinbajo said he is still committed to serving the nation under President Muhammadu Buhari. “Today, they’ve been spreading some information around that I’ve resigned. They said I have resigned; it is all over,” he said. The president had a special security meeting with service chiefs and some state governors on Tuesday.